You've probably seen the cute bubble shaped red bottles in the grocery store-but have you ever tasted Pom Wonderful pomegranate juice? I never had until Pom sent me a case to try. Now, I know there has been recent controversy on bloggers being paid to write seemingly honest reviews of products. So let me preface this by saying that I wasn't given monetary payment to write this. In addition, I've been sent other products to try and write about, but I'm not a reviewer and I only post about things I think are valuable and enjoyable to my readers. First of all, I'm not usually a juice drinker. Yea, milk, water, and yes-soda. But I've found that I have to water down most juices so the sweetness doesn't knock me over and rot my teeth instantly. 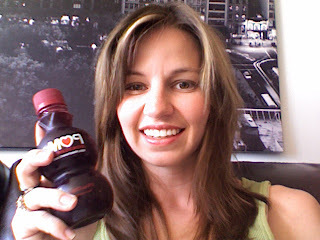 Pom Wonderful is 100% pomegranate juice and the only brand that guarantees that. Along with that, there are no added sugars, preservatives, colors, or fillers. Just the juice. Pom Wonderful tastes like you're eating the actual fruit. And we all know drinking pomegranate juice is much, much easier than wrestling with the seed-filled fruit ending up covering in red juice. It's like the juice is being sincere with me, "Here I am, full of antioxidant goodness, go ahead and drink me and live long and prosper." Pure and authentic. It's a bit pricey but healthy and delicious don't always come cheap and after all, aren't we worth it? What a wonderful story about PomWonderful. Loved it. This is Stacy from Ohio. Thanks Stacy! I just got back from Columbus-I love Ohio! Have you tried skin care made of pomegranate extracts? My daughter just got a sample and she thinks it is awesome. Very strange to share products with my daughter but this green product is unique. They claim that the product contains Omega 5 oil, never heard of it. could be a great nutrient for the skin. Any input? I checked out the website and I guess I couldn't make any conclusions unless I tried the product. I've never tried pomegranate facial cleaner, but I have used Burt's Bees face wash with orange oil and I really like it. I don't know about Omega 4, but Omega 3 fatty acids in fish are really good for you. If the product works, keep using it! I have tried the products of Pomega5, which are pricier than BB's but are worth evry penny, that is, if you like high end products yet green. I mean truly greennnnnn. I adore their soap collection. Hilary -- I suggest you ask for samples, you will never go back to BB.